Located on the South Island's southwest coast, Fiordland is one of New Zealand's most spectacular and dramatic locations. A World Heritage listed region, Fiordland is renowned as the world's walking and sightseeing capital. Most famous as the location the Lord of the Rings movie trilogy was filmed, Fiordland is home to rugged granite peaks, dense forests, glittering lakes and amazing cascading waterfalls which feed into sheer-sided fiords. 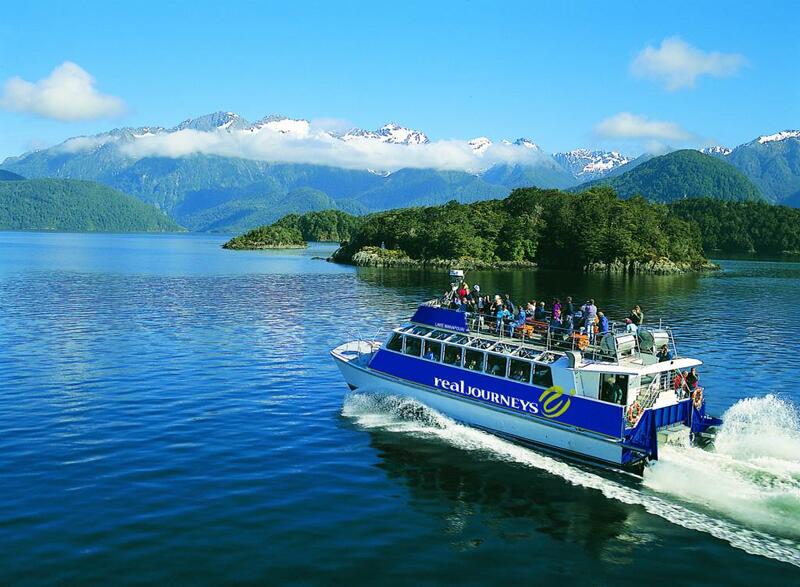 Te Anau is a beautiful resort town that forms the most popular base in Fiordland with popular attractions like Milford Sound, Lake Manapouri and the beginning of the Doubtful Sound excursion just minutes away. One of the world's premier alpine drives, Milford Sound is a must see as are the renowned walking trails of Milford, Hollyford, Kepler and Routeburn. Guides are available for some tracks however in most cases you can explore on your own. Scenic flights are a popular and particularly spectacular way to see the lakes, snow clad mountains and glacier carved fiords of the Fiordland National Park. Cruise the breathtaking sights of sheer rock walls, pristine forests and cascading waterfalls of Milford Sound, Doubtful Sound, Dusky Sound and Breaksea Sound. Keep an eye out for the resident fur seals, bottlenose dolphins and crested penguins along the way. Join an intimate ground to kayak the sea or lake and explore Fiordland. Sail and enjoy a leisurely cruise on the picturesque Manapouri and Te Anau Lakes. Visit the edge of Lake Te Anau and glow worm grotto at the Te Anau Caves. Located in west Otago on the banks of Lake Wanaka, Wanaka is surrounded by Southern Alps and is the South Island's second alpine resort town. The ideal combination of leisure, indoor luxury and outdoor adventure, Wanaka is surrounded by Mount Aspiring National Park's snow-capped peaks. Despite its focus on natural attractions there are still plenty of places to eat, drink, shop, stay and just relax. However, in Winter the snow season takes over the town and the crisp days are enjoyed out on the mountain slopes. For the remainder of the year, Spring and Autumn bring plenty of colour to the town as flowers blossom or foliage turns to red and gold and Summer sees warm sunny days without a cloud in the sky, perfect for exploring this beautiful town. Visit the New Zealand Fighter Pilots Museum for a collection of flyable fighter aircraft from WWII. Enjoy flight seeing over the playgrounds of Mount Aspiring, Mount Cook and Milford Sound. Try your hand at a guided fly fishing expedition on one of the many rivers, lakes and streams for brown and rainbow trout. Tear it up wind surfing, water skiing, sailing and kayaking on Lake Wanaka. If you're feeling brave give river canyoning or white water sledging a go. Join a horse trek and explore the wilderness from the saddle. No matter your skill level, snowboarding and skiing is great at the Treble Cone and Cardona ski fields. The highest mountain in New Zealand, Mount Cook - known to the Maori's as Aoraki or 'cloud piercer' - towers above the Mount Cook National Park. Part of the Southern Alps, Mount Cook is flanked by one of the longest glaciers in the world outside the Himalayas, the 30km giant of the Tasman Glacier. Five hours from Christchurch, Mount Cook village offers amazing scenery including rolling hills covered in golden tussock, wide open spaces and rich glacial lakes including beautiful Lake Tekapo. Located on the shores of the lake is the Church of the Good Shepherd which offers views of the Southern Alps from its altar window. The village comes alive in winter with plenty of skiing while in the summer fishing and hiking are most popular. Take a scenic flight over the peaks and glaciers. Confident skiers will love the Tasman Glacier's 10km. Heli-skiing on surrounding peaks offers the ultimate ski experience. Follow one of the scenic walks for a more leisurely way to enjoy the region. Mount Sefton's waterfalls aren't the tallest but are certainly some of the most beautiful. Mountain biking and heli-biking are highly recommended for fit travellers.